.....Asothama Sath Gamaya!" ring in my ears still from the formative years spent at the St.Thomas Residential School, where this was the school anthem. (Curiously, the last time I heard it was as the background score of Van Helsing, the all-star monster movie!) Latin...no less, quite sophisticated and urbane, I would say. Well, Trivandrum has always had a reputation for its quality of education after all. It has Kerala's most famous and oldest arts college - The University College, Kerala's best University - Kerala Univ., the State's best engineering college - The College of Engineering Trivandrum (Yeeeeah...CET!!! ), the most preferred Medical College, the first International School and many more. Lol, that's quite a collection ain't it? Set up in the 1800s, the University College has been equally famous for its illustrious alumni as for its firebrand politics. The Late President Narayan and many a top State politician have passed through its portals, and many more will in the years to come at this rate..lol! The Kerala University or KU, is by far the best known of the Universities in the State. It is considered as a top quality centre of education even by institutes and universities abroad. KU has embarked on ambitious modernisation programmed including total IT enabling which ranks it among the best in India. Another of k's gems, perhaps the Kohinoor in its crown, is the 67 year old College of Engineering Trivandrum (CET). One of the oldest engineering colleges in India, it stands head and shoulders above the rest in the State. Along with its closest competitor, NIT - Calicut, CET was ranked among the top 20 institutions in India by the World Bank and made eligible for over a hundred crores of funding to raise it to world class standards. In terms of placements, for example, CET ranks right up there with the best, getting the best of recruiters like Google, Microsoft, Cypress and so on to pick up its students, not mention the usual band of Infys, TCS, CTS, Wipro, IBM, Accenture et al who now make offers in their hundreds. CET is the first choice of the top rankers in the State. This doesn't mean that it's a nerdy campus. No way! It has perhaps one of the politically most aware campuses in Kerala and is ever buzzing with extracurricular events like the annual cul-fest, Dhwani, which is the biggest in Kerala. CET was all set to be upgraded to an IIT, as per the recommendations of a high level committee set up by the NDA Govt. in the 1999-2003 period, taking into account the fact that in all parameters, it was the best in the State. However, the next UPA Govt. abruptly changed the decision, as it did many other cases, and chose to upgrade a rather more recently setup "technical university" in Central Kerala now more famous for admitting literally illiterate students into its technical courses...lol! Anyways, soon afterwards the Central Govt. made it clear there was to be no upgradation to "IIT" status as much trumpted in the local dishrag media. The whole scheme is in limbo these days as the University authorities try to swallow their pride and get back to work on some sort of upgradation plan. Meanwhile, the Union and State Govt.s have agreed to set up a new centre of the IIT - Madras in a 250-acre plot of land near the picturesque hill station of Ponmudi, 80 Kms from Trivandrum. This will become Kerala's first "Eye Eye Tee" in the next 5-6 years. Trivandrum Medical College and Hospital, the oldest in the State, is being upgraded to the status of an All India Institute of Medical Sciences, under a Rs 100 crore plan funded by the Union Govt. Together with the apex Sree Chitra Thirunal Institute of Medical Science & Technology, the Regional Cancer Centre and a multitude of superspecialty hospitals around it, this makes Trivandrum a medical treatment, research and education hub, almost unmatched in India. The prestigious Asian School of Business, currently functioning inside Technopark, counts the bosses of TCS - Mr. Ramadorai - and Infosys - Mr. Gopalakrishnan - in its illustrious Board of Governors and has a student body and faculty drawn from across the country and the world. Seventeen engineering colleges and five medical colleges add to the awesome collection of Higher Education institutes in and around the city, as do some of the best arts, science and commerce colleges in Kerala such as the Govt. Arts College, All Saints College, Mar Ivanios College and so on. The Rajiv Gandhi Centre for Bio-Technology, Indian Institute of Information Technology and Management, Centre for Development Studies and C-DAC are some of the national-level, advanced research institutes located around the city. A National Institute of Fashion Technology and a Molecular Science Institute are all set to join this repetoire soon. All this has been traditionally backed up by an excellent public and private school system. Some of the top schools in the State are in the city. Trivandrum International School located about 10 Kms from Technopark is the State's first International School. The city's famous public schools like Cotton Hill Girl's school, have been producing top rankers every year. All this has positioned Trivandrum in the right spot to ride the coming IT/ITES wave. This latest wave(tsunami, rather) is based on Knowledge and thus summons all available graduates, post-graduates , near-graduates and barely graduates to its portals. Already the IT hub of the State, and the fourth in the quatret of State Capitals/IT hubs in South India, it will generate thousands of jobs a year as IT companies set up shop and expand. Once berated as a "service" city, which had little industrial infrastructure, Trivandrum has turned that on its head. The Knowledge economy is clean and tidy, and demands smart people and high tech working environments, which suits our green city just fine. After all, the industrial hub of the State has just been declared as one of the most polluted places in the country and its citizens are choking on assorted PCBs, metallic toxins and the like while trying in vain to escape the bites of the ever vigilant mosquitoes. 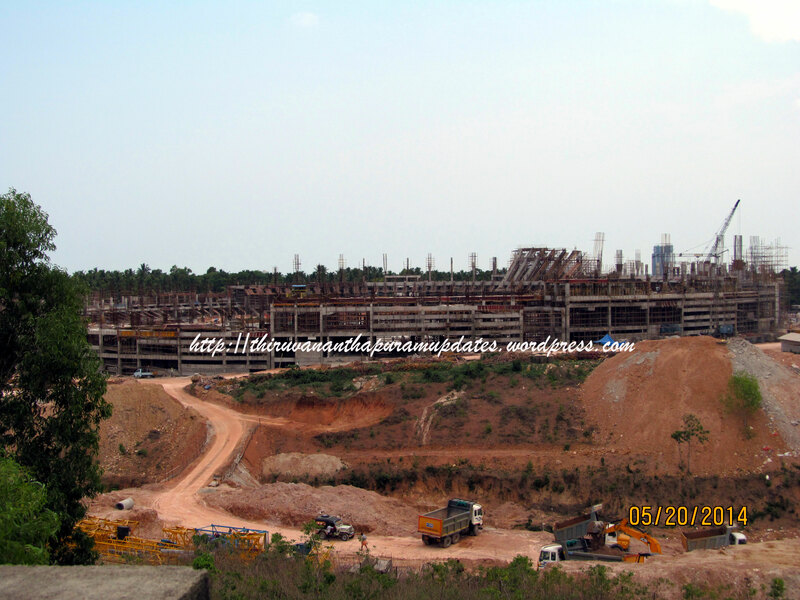 The age of the polluting factory is past, this is the age of Eye-Tee, atleast in God's Own Country! I happened to hear about your blog and am very much impressed about your blog subjects... Well, Trivandrum is indeed rising, and thats a very important topic you put across, as you said, I couldn't even recognize some buildings. But what about the IIT, is it going to work out??? What is the status of the ragging there? Is it still as uncivilised and barbaric as before? Politically aware campus - is that not a euphemism for irresponsible 'students' to strike and disrupt classes at will? I am sorry if I appear sceptical - but I decided to leave TKM College of Engg in my first year due to inhuman ragging - and therefore I am dead against ragging in any form; and during my Pre-Degree course at Arts College, student parties like SFI and KSU disrupted classes irresponsibly evry third day. And how is the industrial discipline in Trivandrum? Before we trumpet about our city, let us be aware of its faults, and at least make a mention of the faults.